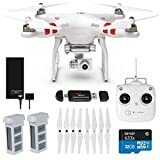 Amazon has the DJI phantom 2 Vision+ V3.0 quadcopter with gimbal-stabilized 14MP, 1080p Camera + extra battery and a 32GB microSDHC Memory Card plus reader for $699 with free shipping. Sells for $1899+ Highest Price. Deals for $699 Lowest Price. Normally $1203+. Ready to fly: The phantom 2 Vision+ is simple to set up and super easy to fly, making it the first aerial filmmaking system for everyone. Now you can shoot fully stabilized video from the sky, right out of the box. 3-axis camera stabilization: A built-in high precision 3-axis camera stabilization system brings a whole new level of smoothness to your aerials and gives you total creative freedom in the sky. High performance camera& parameter settings: The phantom 2 Vision+ carries an extremely high quality camera and a 4GB micro SD card. It shoots full HD video at 1080p 30/60i, 720p 60for clean slow motion and takes 14 megapixel stills. Camera settings can be adjusted through the vision app. Improved Power: New motors, propellers, and ESCs combine to give you greater thrust and control than ever before. You can load more equipment on your phantom, and achieve up to 200g/axis of extra thrust when using a 3S LiPo battery with this completely new system.